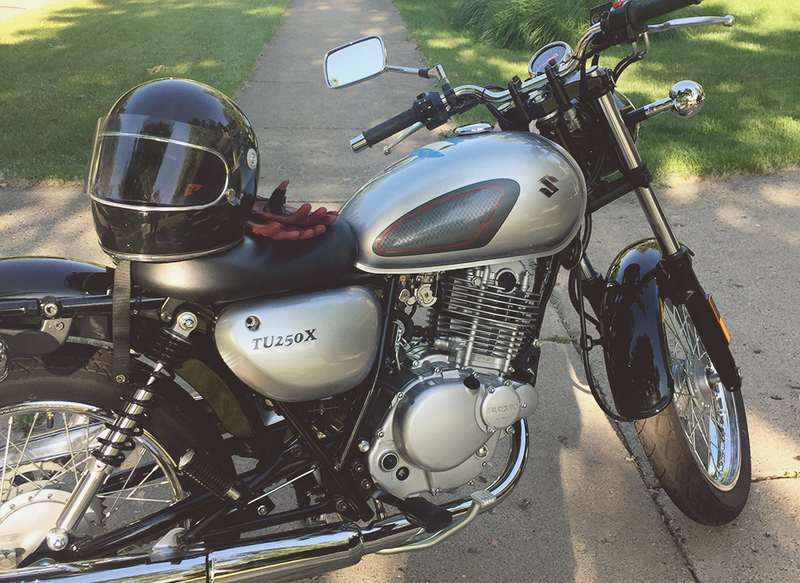 Last week I talked about how my interest in motorcycles developed; this week’s installment dives into buying my first bike, and why I ride. I was having trouble finding a bike in my size – being only 5’ 3,”seat height is a real factor – your feet have to touch the ground! As a very petite beginner, engine size was an issue. For anyone unfamiliar with motorcycles – the higher the CC (cylinder capacity or cubic centimeters), the bigger the engine and the heavier the bike – there are certainly exceptions, but this is a fair reference. I wanted something with smooth shifting and a certain aesthetic. I had a lot of parameters. This should come as no surprise. My search was akin to Goldilocks and the Three Bears. Too big, too small, too old, too new/expensive. After spending a couple weeks in hot pursuit, I found a like-new 2013 Suzuki TU250x for sale at a dealership in northern Ohio. It had 101 miles on it, and a couple chips in the tank – an older gentleman had bought it new, but ultimately decided a manual transmission was too much action for him. He traded it for a scooter. 250cc was smaller than what I wanted, but I hadn’t found anything bigger that made sense for me. 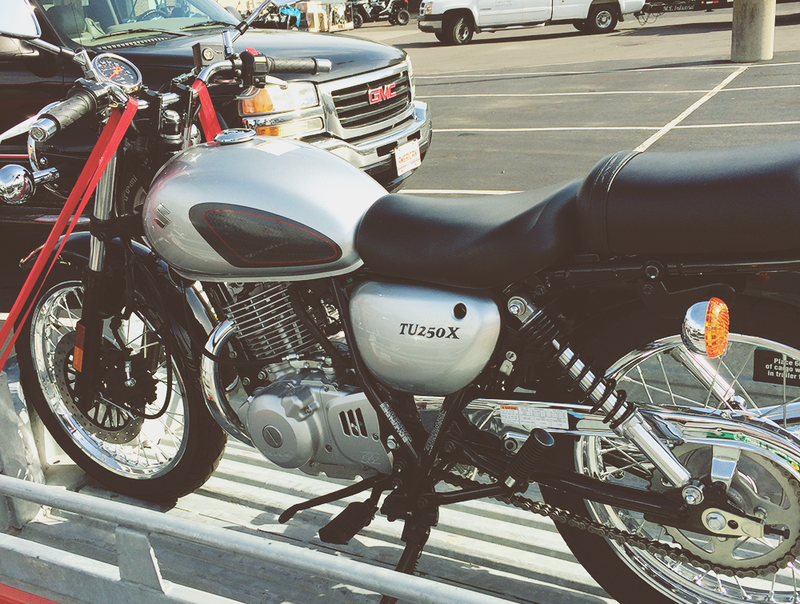 A high-mileage bike wasn’t going to cut it – as neither Ryan or myself have any small engine prowess. I wanted to learn to be a better rider, not a mechanic. One thing at a time. The price was too good to pass up. A like-new bike, maintained by a dealership, with tax, title, and fees for $2,500? No brainer. A perfect bike to continue learning on. And here’s the part I’m pretty proud of – I called the dealership and negotiated them down in price and took care of the details all on my own. I reserved a motorcycle trailer at the local U-Haul, went to the bank, and called the insurance company. 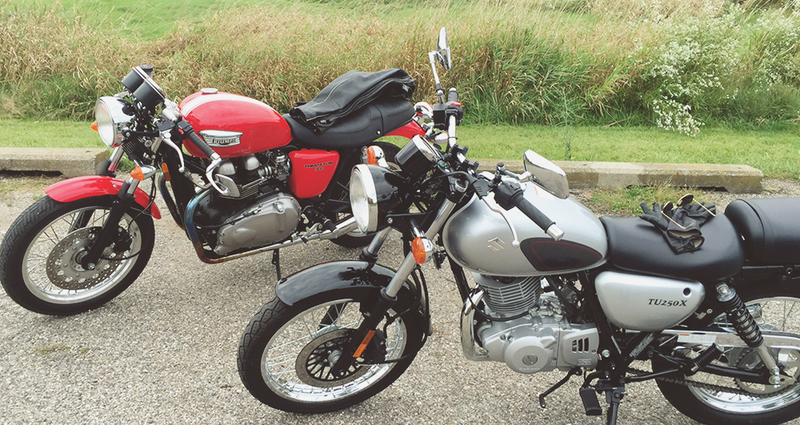 On Saturday morning we left bright and early, and were home – new motorcycle in the drive – by lunchtime. I took it around the block a few times to get comfortable; there were definitely a few “what have I done?” moments. Soon the jitters subsided (a little), Ryan dusted off his Triumph, and away we went. But wait, WHY did I buy a motorcycle? I’ve always felt a little unconventional, sort of a square peg in a round hole for most of my life. I like girly things but much to my occasional irritation, practicality reigns supreme. I rarely have my nails painted because there’s usually some project going on that involves manual labor. I don’t know how to contour or do a smoky eye, but I can strip and re-grout tile. Self-sufficiency is one of my favorite traits. And getting wholly off-track, I love my man hands. I’ve never shied away from pursuing an activity because it was out of the norm or against expectations. When I took that basic rider course back in 2008, it was out of a feeling of practicality. It made sense to have some know-how. But when I picked up the hobby again last year it was out of a sense of curiosity – to see how I would fare under pressure, to test my limits, and really learn a new skill. Riding a motorcycle, going to festivals, and concerts are all in the same vein for me. There’s endless possibility, excitement, and maybe a little daring – a chance to step outside yourself. A freedom. Cliché? Maybe. See, we’re all bound by ridiculous laws and expectations, the list of “shoulds” seems endless. Sure, adulting can be fun, but it creates baggage. Standing in front of a stage, or shifting through the gears on a motorcycle helps me forget those things altogether. It’s meditative. The motorcycle is a way to dial up the feeling I get at music festivals. More alive. Dancing in a crowd of 30,000 people with the same intention makes me feel part of something bigger, yet tiny – it’s the same on the bike; mighty, yet humbled. There’s a whole moto community out there that I haven’t even scratched the surface of. And thanks to social media, riders have an unprecedented opportunity to connect with one another. I’m excited to be part of a group that empowers one another and celebrates diversity. The folks in the women’s motorcycle community in particular come from all walks of life; what joints us is a love of riding, and the pleasure of doing something a little subversive and badass. Every time I go out, I’m getting a little better and more confident. The motorcycle gives me a chance to continue working on a skill that’s also great fun. Mastering something that once terrified you is a pretty powerful feeling. And isn’t that the ideal for any pursuit in life?